Country’s hottest duo scored another number one this week. Their second radio single, “Sun Daze,” off their sophomore album Anything Goes reached the top spot on both the Mediabase and Billboard Country Airplay charts. It’s a track that continues to push the boundaries of pop country and one that’s received mixed reviews. Some are hesitant to praise a song that seems to revolve solely around getting high and drinking beers, while others continue to push FGL as the future of country. Whatever your take, there’s no denying their success. The wait for Florida Georgia Line’s sophomore album is finally over. The wildly popular duo released their sophomore album entitled Anything Goes today. Packed with twelve hits, the album is everything we could have asked for and more. 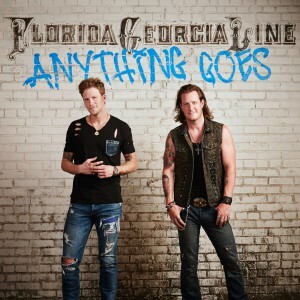 Whether the duo is kicking off a party with title track “Anything Goes” or sneaking off with their girl and “Bumpin the Night” FGL certainly hasn’t disappointed. Update (1/15): Florida Georgia Line announced the second leg of their Anything Goes Tour on January 15th. The duo will hit an additional 29 cities throughout the summer and into the early fall. They’ll bring Thomas Rhett and Frankie Ballard along for the entirety of the tour. The most popular duo in music and the most popular act in country music has some big news. Florida Georgia Line has made doing it big their motto and that’s just the case in 2015. The duo will be embarking on a World Tour! The duo announced the first leg of their Anything Goes Tour earlier this week that included the US dates and the world tour dates are expected soon.